Tomorrow (5th September) sees Brighton’s B-team Rockerbillies return to open door action. Following on from their home debut at May’s Fringe double header – and a battling day at the Eastbourne Extreme outdoor derby tournament in July – the second team will be heading west to meet Southampton City Rollers. This will be SCR’s first open door home event and the Hampshire side have chosen a RuPaul’s Drag Race theme for the day. The action takes place at Applemore Leisure Centre in Dibden, Hythe with first whistle at 2pm. Tickets are available from the online link at the bottom of this preview, priced at £5 (+97p fee) for adults and free for under-16s (rather than just under-12s as is more usual in derby). Online sales finish this evening (Friday), but tickets will be available for £7 on the door. The postcode for you car types to point your vehicle towards is SO45 5ON, with AA Route Finder suggesting around two hours journey time for the 75-ish miles from Brighton. (NB set your SatNavs for Hythe in Hampshire rather than Hythe in Kent, yeah.) For us public transport folks, don’t be fooled by the train line running through Hythe (Hampshire) on Google maps. Although the town did have a station, this entire branch line was closed in the 1960s and remains shut, despite regular rumours of a possible re-opening. This makes the venue a bit of a mission to get to. The nearest station is Southampton Central, which is a little under two hours from Brighton for £15.30 return (£10.10 with railcard). From there you have two options. There’s the number 8 bus (04 and 34 past from the station) which drops very close to the leisure centre in 40 mins. More excitingly, from the quayside there’s a Southampton-Hythe ferry, which also includes a ride on a pier railway. Although this leaves you 25 mins walk from the venue, Hythe’s pubs are all located close to the ferry pier – we’re assuming there’s no bar on the ferry! Hi there. Can you tell us a bit about SCR’s history to date… In February 2013 Laura Streets, our founder, was bitten by the roller derby bug and decided to make a Facebook page, gauging interest in local team for Southampton. She went to Mo Roller, the only roller skating hangout in the area, to see if she could find some like-minded people. It was there that she met Blitz, who jumped on board with the idea. They started skating with the Dorset Roller Girls, as well as taking lessons at Mo’s, in order to learn as much about the sport as they possibly could. They met White Lightning a month later, and the three of them joined forces, creating the Southampton City Rollers. The second half of 2013 saw our first ever training sessions, the initial team structure being put in place, and our first official Fresh Meat starting up. We played our first closed door scrim against Bath in December 2014. 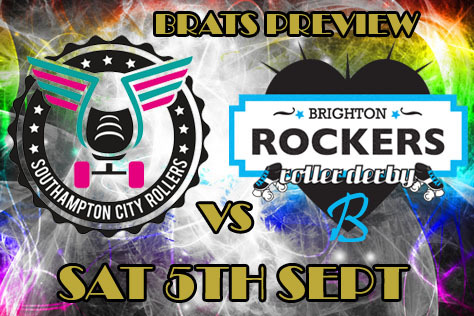 This year has seen our second Fresh Meat Intake, our first outdoor bout (at Eastbourne Extreme) and – tomorrow – our first ever home bout… ROLLPOCALYPSE! What do you know about your opponents, the Brighton Rockerbillies? We know they are worthy opponents and we look forward to seeing them on track. We recognise a couple of players from having played in mixed games with them previously, so we’ll be keeping a keen eye out for them. They seem to be a team of fearless and exciting skaters, we’re hoping it’ll be a good game to watch and a fun game to play. Any SCR players the crowd should look out for, and what kind of a game are you expecting? It’s our first ever home game, and we’re so excited to have made it to this point – we’re hoping that will really come across to everyone involved. This game is an opportunity for both teams to showcase the skills they’ve been working on over the past few months, and a chance to enjoy roller derby as the fun sport it is. We can’t predict a score as we haven’t played the Rockerbillies before, but we’re not too focused on the scoreline, more on all the awesome things we can learn from playing as a team. What can we expect from the venue and from the after party? Applemore Leisure was a great find in terms of a venue for our first bout. There is plenty of seating and areas around the edge of the track (but within a safe distance) for the public to watch from. I would expect to see a lot of people dressing in drag and really pulling out all the stops at the event, getting totally on board with the theme of RuPaul’s Drag Race. We do love a bit of glitter and glitz! The theme itself was the brainchild of BAMbi, our Head of Bout Production, and we’ve been looking forward to it for months. The after party is at the London Hotel in Oxford Street, Southampton, which is a traditional pub for all walks of life. It’s attitude free, welcoming to all kinds of people and generally with a superb atmosphere. The London often has drag acts, so it fits perfectly with our theme. We can’t wait! Finally, what are SCR’s derby ambitions going forward? It is fantastic that, after two years of hard work, we’ve come this far and will have completed our first bout on home turf. Going forward, we hope the team with continue to grow in strength and size. Our skaters will continue to enjoy being coached by a variety of people within the derby community, from the many different teams we have built bonds with, gaining a wealth of experience on and off the track. We are re-opening the Fresh Meat programme in January, where I’m sure we will have another massive influx of passionate derby skaters, NSO’s and refs. We’ve had a lot of interest in skating from male participants, too, so there may even be a men’s team in the next couple of years. “The Southampton City Brollers” are definitely in the pipeline, so watch out, MRDA! We also have a webshop opening in the next few months, which will allow people to purchase merchandise. Our logo and team colours (the awesome pink and turquoise!) have attracted a lot of attention, simply because it looks so good. I’m sure a lot of people will be rocking our tops in 2016 if not already! We’ve seen new Brighton B-team the Rockerbillies in action twice so far – against a mixed team at the Dolphin in May and in an outdoor tournament in Eastbourne in July. Tell us about those events… They were two completely different days for us as a team. We played at the Dolphin on a floor we knew, in a format we knew and as a team that had played together before. However, we totally mixed it up for Eastbourne Extreme, which was our first experience of both a tournament and playing outside. We had some amazing Fresh Meat move into main training that month and figured we’d give them a baptism of fire – we even made them jam! Boy, did they do us proud. We couldn’t be happier with how they performed. And we had all the fun! Whilst those were your only open door events, have the Rockerbillies been getting any other games in? We have had a few closed door games this year which were a lot of fun. The team is going through a lot of changes at the moment as we mix things up and bring new skaters in. We’re looking to build on all our experiences and develop a great bouting B-team. 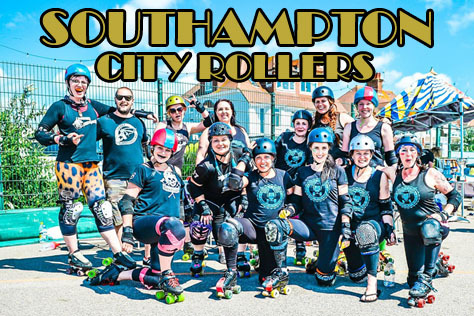 What do you know about your opponents, the Southampton City Rollers? Any of their players you’ll be looking out for? Our Lovely Bionic Betty has been spending some time with Southampton this year as they prepared to debut their team – not as a spy, I promise! She tells us that White Lightning (the skater not the cider) is pretty awesome. We can’t wait to meet a new team, hopefully this can be the first of many more games. Any particular Rockerbillies players or tactics the crowd should look out for? What kind of a game (and result) are you expecting? We’re not giving away any tactics. People used to seeing the Rockers A-team All Stars in action will recognise a few of the plays, but we have Dream Team moves of our own. I never predict results, but I know we will have one hell of a fun game. An Extravaganza! Finally, what are the Rockerbillies’ plans and ambitions going forward? We had an amazing group of Fresh Meat graduate this year and we plan on making them killers. Coaching are moving new skaters up to main training every week, so I wouldn’t be surprised if in our next game we have a very different team once again. 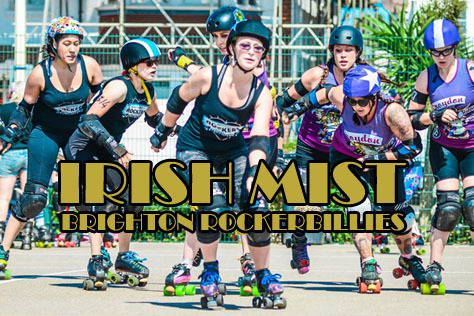 We want the Brighton Rockerbillies to be a force to be reckoned with in the UK derby scene.